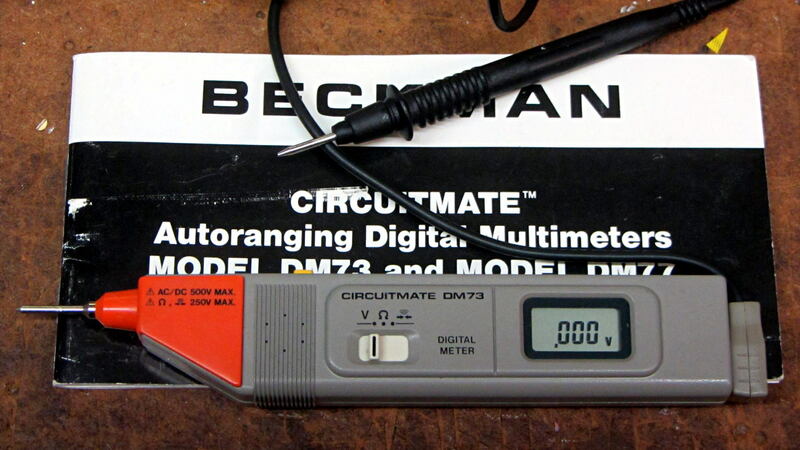 Beckman DM73 Circuitmate: Back From the Dead! I worked minute dots of Caig DeoxIT into the switches, without disassembling them, with magical thinking guiding my technique. One of the battery connections seemed suspect, but we’ll never know. In any event, it beeps happily when turned on (*), the LCD behaves properly, it’s no longer pressure-sensitive, and life is good! It surely needs calibration, but that’s definitely in the nature of fine tuning. Thanks for nudging me into Doing The Right Thing™. (*) Including the double beep with the AC/DC button held down.